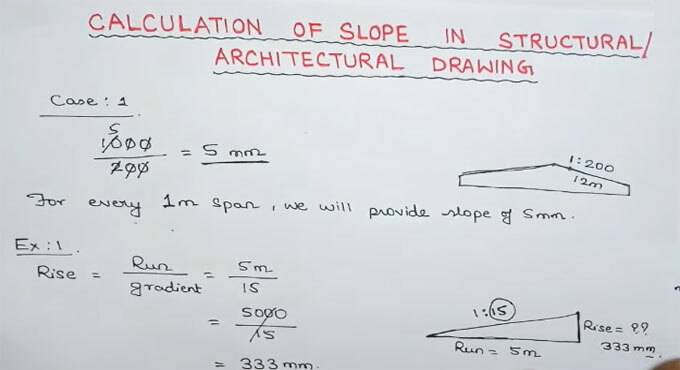 In this construction video tutorial, Mukesh Shah from learning technology, provides some useful technical information on how to make estimation of slope in structural and architectural drawing in construction site. Suppose the slope gradient for a slab is taken as 1:200. Now, you have to estimate the slope. Just put 1000 in place of 1. Now, divide it with 200 i.e. 1000/200 = 5 mm. It signifies that for each 1 m extent, the slope of 5 mm can be arranged. Generally, there are various methods to specify the slope of a surface corresponding to the horizontal plane. These methods are known as degrees, gradient, and percentage. Calculating a Slope Gradient: Slope gradients are provided as Y:X, where Y denotes a single unit in rise and X denotes the run. Both numbers should utilize the similar units. As for example, if you move 3 inches vertically and 3 feet (36 inches) horizontally, the slope should have been 3:36 or 1:12. It can be taken as a "one in twelve slope." Slope percentage is estimated following the similar method as the gradient. Transform the rise and run to the similar units and then divide the rise with the run. Multiply this number by 100 and you will obtain the percentage slope. As for example, 3" rise divided by 36" run = .083 x 100 = an 8.3% slope. It is the laborious method to estimate slope in degrees and it needs some knowledge in maths. The tangent of a specified angle (in degrees) is equivalent to the rise divided with the run. So, the inverse-tangent of the rise divided by the run will produce the angle. Watch the following video tutorial, to learn the complete slope estimation process.